No, it’s not color correction. And don’t worry, you aren’t hallucinating. 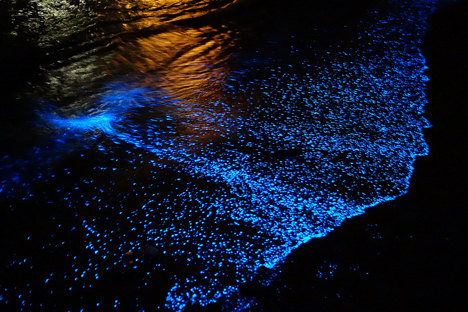 That’s pure mother nature at work in these bio-luminescent phytoplankton. 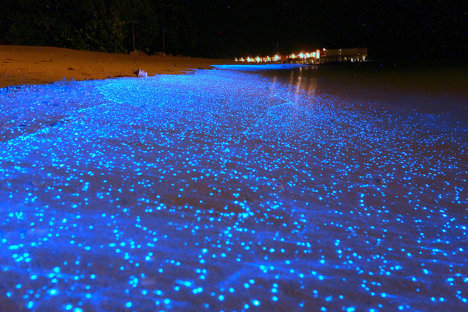 Awash on a beach in the Maldives, they’re a literal sea of stars. Taiwanese photographer Will Ho came upon the millions-strong wash of tiny wonders while vacationing on the islands. His pictures not only capture a rare natural event but do so in a manner that piques the imagination. Scientists have known what makes the phytoplankton tick for some time. Under further scrutiny, Ho made the same discovery. 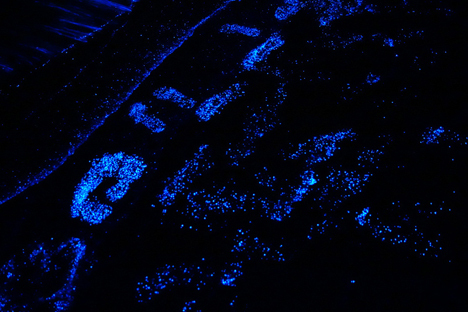 The little guys react to stress, as evident in the photographs where footprints are clearly marked among the blue gel-like beach. See more in Earth & Nature or under Science. February, 2014.